The USD/JPY fell to 110.84, dragged by US Treasury yields, which fell to their lowest level in over a week after the ECB decided to keep its monetary policy unchanged and expressed concerns about slowing economic growth. The US Federal Reserve, in its turn, echoed ECB’s comments which gave the US equities some support as the risk-on sentiment was back on. 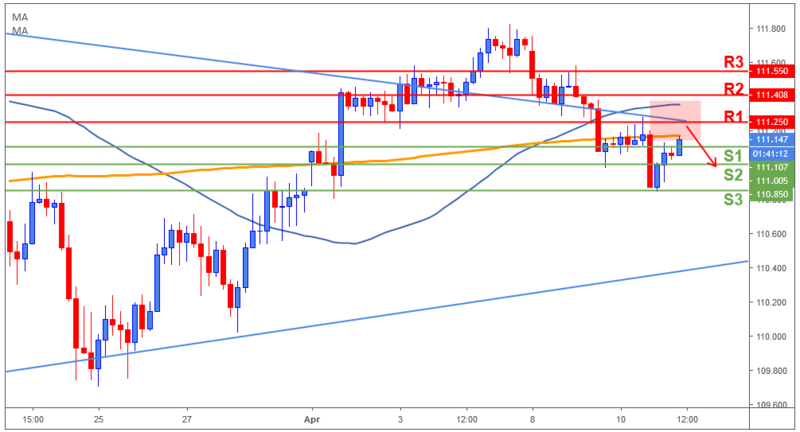 In today’s session, the Dollar bulls will attempt to bounce the pair back as long as the risk-on appetite prevails, but it won’t be an easy battle as traders are aware that the global economic slowdown is still the main headline to focus on. Earlier today, Japan released some minor money data, but none of them important enough to impact price. The USD/JPY temporarily broke below multiple support levels but now price is retesting yesterday’s highs. The pair is trading just below a confluence of resistance levels; 50/200-day moving averages, 111.25 (R1) and the bearish trend line. Price is likely to lose the bullish momentum around this area to potentially retest yesterday’s lows. If, however, a break occurs to the upside, it could easily retest 111.40 (R2) or 111.55 (R3).